Family Man - Notes: 260-269. 261. I consider “vween” as a transcription for canine whining to be my greatest contribution to comics onomatopoeia. 262. An old trick for carrying water without lugging heavy wooden or metal buckets around with you across the landscape – make them out of treated leather and rope, instead. 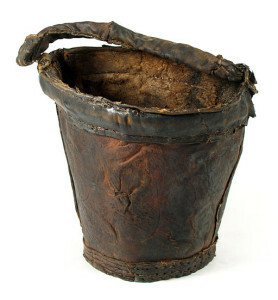 They’re out of style now (except as handbags…), but leather buckets have been around for ages. They’ve been recovered from 16th century shipwrecks, and fancy painted versions were still being used by bucket brigades to put out fires in the 19th century. 263. Another visit to our wolf statue friends who guard the town gates, from when Luther first entered Familienwald. Hm, do we still think they’re guarding the town against the woods, or are they guarding the woods against the town? The mansion’s stables have seen more crowded days. 264. No, not barfing. Just washing the ash off her face. 265. 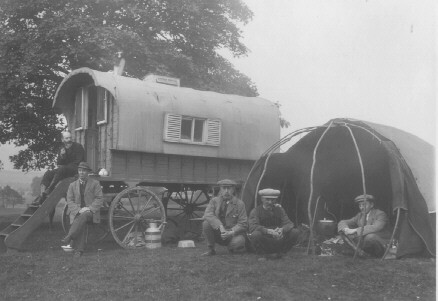 Here’s the Romani caravan again, now parked outside the Library. UK Romani group with “Bender” tent. This family has some pretty built-up wagons for the time, but they still probably don’t “live” inside them. The elaborate residential wagons most Western (and particularly British) people associate with the Rom didn’t really come into vogue until the 1800s; most families would travel on foot with tilted carts in tow, and did the majority of their living and sleeping in tents – or underneath the cart if the tent wasn’t an option. but it would be a cramped fit with any storage goods. This daily life stuff isn’t terribly easy to research (especially for Romani groups outside of the UK, where much English-language information is focused), and I’m always finding stuff after I draw pages, so there are no tents shown in this chapter. For the sake of expediency, I’ll say that any tents are just packed up at the moment. If I can ever nail historic living arrangement details down well enough to be sure I’m not wrongly applying UK-specific practices for this geographic region, I’ll revise the pages accordingly. Your sources are appreciated! 266. It appears that this is a regular yearly arrangement. They’re hunkering down on University property. He’s calling her a crazy white lady (or, to be more precise, a crazy non-Romani lady.) He is not wrong. 267. Ovid is still on the shelf, and little does Luther suspect how much action he is not going to get any time soon. 268. Luther’s whistling the same Bach tune that his brother was, all the way back in Chapter 1. 269. As previously mentioned, they’re speaking a variation of Carpathian Romani (Romungro Romani), and more specifically the period-appropriate version of the North Central Romani dialect. As in many cultures, dogs are considered ritually unclean (mahrime), so “dog” is a pretty sick burn. The scarf the boys have stolen is a head or neck scarf – it’s unclean to touch anything a woman wears below the waist. “Little flea” (Pušomori) is a fond family-use name for a lively, diminutive girl. Most Rom would have an official name of Western Christian origin (imposed by law in some places) that they used with outsiders; a Rom name used inside the family that often referred to a personal characteristic or behavior; and, in some groups, an “other name” used as a secret true name known only to the parents. An individual’s socially-used Rom name functioned as a false address to confuse evil forces looking for a victim.